Spacious, air-conditioned interiors, large tinted windows and first class seating provide a superior level of luxury and comfort. Spirit of Migaloo is custom designed for environmentally friendly whale watching with ultra-quiet low emission engines, toilet waste holding tanks and whale-friendly keel to ensure the whales and their ocean environment are not harmed. Four levels of open viewing decks provide an incredible whale watching platform and passenger numbers are restricted to ensure your experience with the whales remains a relaxed and personal one. An impressive AUD1.5 million on-board Whale Theatre entertains, informs and reveals the world of the whales like never before with a colourful mix of 3D animation, Real-Time tour map technology and live whale songs. Sea World is only 20 minutes from the whales which means less time getting there and more time with the whales leaving the rest of your day free for other activities. 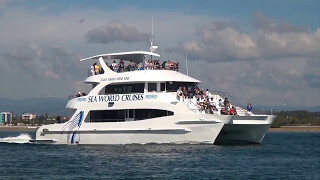 Sea World Whale Watch on Australia's Gold Coast offers premium whale watching tours with expert Captains and Tour Guides aboard the world's most advanced whale watching vessel Spirit of Migaloo. A full refund is provided if your tour fails to sight a whale from June and October.